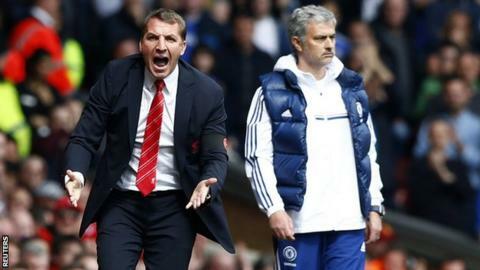 Liverpool manager Brendan Rodgers accused Chelsea boss Jose Mourinho of "parking two buses" to get his side's 2-0 win at Anfield. The Blues, who sat deep to contain the league leaders, were gifted Demba Ba's opener by Steven Gerrard's slip before Willian sealed the win in injury time. "They parked two buses, rather than one," Rodgers said. "From the first minute they had 10 men behind the ball. "We were the team trying to win but we just couldn't make the breakthrough." Liverpool's defeat ended their 11-game winning run and means their bid to win their first league title for 24 years is no longer in their own hands. Instead, if Manchester City win their remaining three matches, they are likely to win the title because of their superior goal difference. As for Chelsea, they lie second, two points adrift of Liverpool, but apparently no chance of winning the title, according to Mourinho. "We are not in it," he said. "The champions will be Liverpool or City. We have nothing to celebrate." Liverpool are the highest-scoring team in the top flight and have often used a fast start to over-run teams at Anfield, where they had previously dropped only five points out of 50 this season. But they could find no way past Chelsea, who have now beaten the Reds and Manchester City home and away this season. Rodgers, whose side still top the table by two points, was unimpressed by the defensive tactics employed by his old mentor and disagreed with Mourinho's claim that Chelsea were the better team. "When you win the game, of course you will say that," Rodgers added. "But we were the better team with the ball. We just could not unlock them. "It was difficult because they virtually played right from the off with a back six. They had a back four, with two wingers back and then the midfield three in front of them. "Just putting 10 players right on your 18-yard box is not difficult to coach, but it is obviously much harder to try and break through it." Rodgers, who worked as a youth and reserve-team coach under Mourinho during the Portuguese's first spell at Stamford Bridge, says he would never use such a negative approach himself. He added: "Jose is happy to work that way and he will probably shove his CV in front of me and say it works, but it is not my way of working. "I like to take the initiative in games, to try to dominate them and let my players express themselves. "Chelsea have been wonderful and it could not have gone any better for them. Liverpool just have not been able to get through Chelsea at all - they were wonderfully disciplined, very organised, very good defensively." "If a defensive style gets results, great. Jose has got his result here and he will be happy with that. "But it is the polar opposite to how we work and hopefully over time our offensive mentality and aggression will get us long-term results." Rodgers was also unhappy with Chelsea's time-wasting tactics that saw them dawdle over set-pieces and dead-balls, starting in the first minute when Mark Schwarzer stalled with a free-kick after Raheem Sterling fouled Ashley Cole inside the Chelsea area. "I think everyone could see that from the first whistle it was clearly the plan to frustrate us," said Rodgers. "We are a team that tried to win the game, in a sporting manner. We tried to initiate play with the ball but it was just not to be."